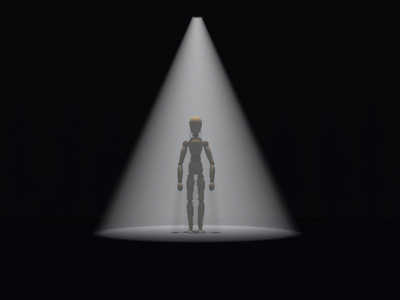 A new and hopefully fairly regular feature for Too Many Ideas – lighting rig ideas for use with Vue. I’m going to kick off with a series of rigs inspired by theatrical lighting. Tonights rig is one of the simplest: a single spot light directly above a figure. This image shows the principal of this set up. 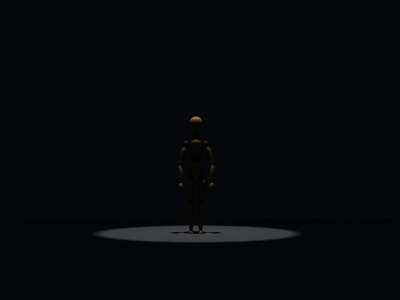 This rig’s main advantages are that it is simple, quick to render and casts a small shadow on the stage and scenery. It is also quite dramatic evoking images of figures lurking beneath street lights in film noir detective movies. However as the next image shows it has several flaws. Light falls mainly on the top of a figures head, the chest and the shoulders. little light falls on the front of the face leaving the eyes, mouth and nose all in shadow. This lighting rig shows none of a character’s expression for most poses. Shadows from the head, arms, chest can fall in an unatural looking way on lower body parts. My last image replaces the manakin with a less wooden performer. The use of a little volumetric smoke in the light helps bring her out from the blank background. She appears mysterious and brooding as her face is not visible. The strong shadow of her head detracts from the picture.